I’m guessing you’ve not heard about the TCOT Report. I hadn’t until yesterday. It just started this month. But it got my attention, because it’s a really innovative use of Twitter for grass roots idea generation and discussions. Social media skeptics rail against the echo chamber of geeks talking to one another about how grand social media is. So when non-geeks start leveraging social media’s best characteristics to improve things, it warrants attention. OK, so what is TCOT? This list was first placed on the web on November 28, 2008. In the short time since then, it has become a bit of a rallying point for conservatives on Twitter. I think all of us who are on the list can conceive of many additional ways to improve the list to strengthen and grow the conservative community on Twitter. You must primarily tweet on conservative themes and cannot be merely a “campaign profile” “political office holder profile” or a “radio or television program or publication promotional profile” to be on this list. New participants are welcome. Just nominate someone you follow or yourself and show that you are primarily on Twitter as a conservative. The list itself is a resource for other conservatives looking to find like-minded people on Twitter. What I found interesting was the TCOT Report. And I even got a reply from someone in the TCOT community. The site also includes links to various news articles, opinion pieces and blogs. To really understand the import of this initiative, consider the Rush Limbaugh ditto-heads. Rush Limbaugh has millions of listeners to his daily radio show. People who are interesting in the news, and have opinions about it. The “social media” experience of this was to listen to your radio at the same time as everyone else. When it comes time for communicating with others, there are two online formats for that: email and forums. Both have their place. Email is a great way to direct an action campaign. Forums, such as lucianne.com, are great for longer discussion threads where all comments are displayed. Twitter appears to occupy a third spot, with some overlap with those other two. Twitter lets folks express major or minor points easily, without guilt or worrying about whether a forum thread will grow. The hash tag identifies both the message and the person. And Twitter lets everyone weigh in on the events of the day, establishing their own brand of conservatism through their series of tweets. At its best, politics is a world based on ideas. The ability to put forth an idea and argue persuasively is a the basis for the presidential caucuses that Barack Obama did so well with. Once the election is over, what’s a person to do with all these ideas and enthusiasm? Channel them into engaging your fellow philosophical travelers. And right now, the Republican Party is thinking hard about its next moves. Given the grassroots orientation of the party, use of social media to discuss and spread ideas seems like a terrific idea. And if you haven’t opened a Twitter account (or haven’t figured it out yet), make sure to join TCOT. #TCOT @michaelpleahy Great to see so many conservatives on Twitter. It’s clear why everyone at @FreedomWorks wants me to use this more. Not bad for a site that’s been up for a few weeks so far. I imagine some readers of this blog don’t agree with the Republican Party. That’s not my point in writing about TCOT. What interests me is the way some basic social media tools are being used for potentially great effect. Twitter? Never be mainstream. Hashtags? People can’t be bothered. Twitter search? Why would I want to read the garbage people write? What TCOT is doing is showing the potential in these tools. It’s too early to tell how this initiative will turn out, but a quick scan of the #TCOT tweets shows a lot of interest in this. I suspect the Obama administration and Democratic Congress will give a lot of energy to the TCOT Report. No one will displace the Drudge Report, but adding the instant reaction, and multiple points of view on myriad subjects in real-time is something that has proven addictive elsewhere. If nothing else, I’m glad to see the continuing experimentation with social media outside the geeksphere. That is someone’s List on FriendFeed. They’re put him into a List called “Curmudgeons”. 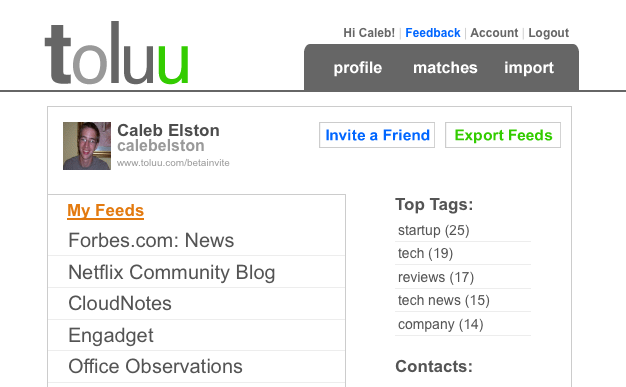 You can customize your own referral URLs with FriendFeed Lists. The tags you use for a blogger will be seen by that blogger as they look at their referral traffic. You can create a List, click through on it, and the blogger will see your special anonymous message. Lists are easy to create and delete, meaning you can do it as much as you want. So have fun with your favorite bloggers – send ’em those subtle messages with the tags you use in your Lists. But you don’t have to do that with me…uh…we’re cool, right? As discussed here before, FriendFeed’s beta version includes the ability to tag users, putting them in different Lists you create. You can create your own programming channels. Now that I’ve got themed Lists, I want there to be some good content in them! Right now, I’m subscribing to a lot of FriendFeeders who are into Enterprise 2.0 or who have an amazing eye for pictures. Managing a high flow of content is a lot easier. You can take users out of your Home feed, and tag them into different Lists. Check the Lists at your leisure, and you can see content for many, many more people. It doesn’t all just go flying by you. How about you? You started your Lists yet? 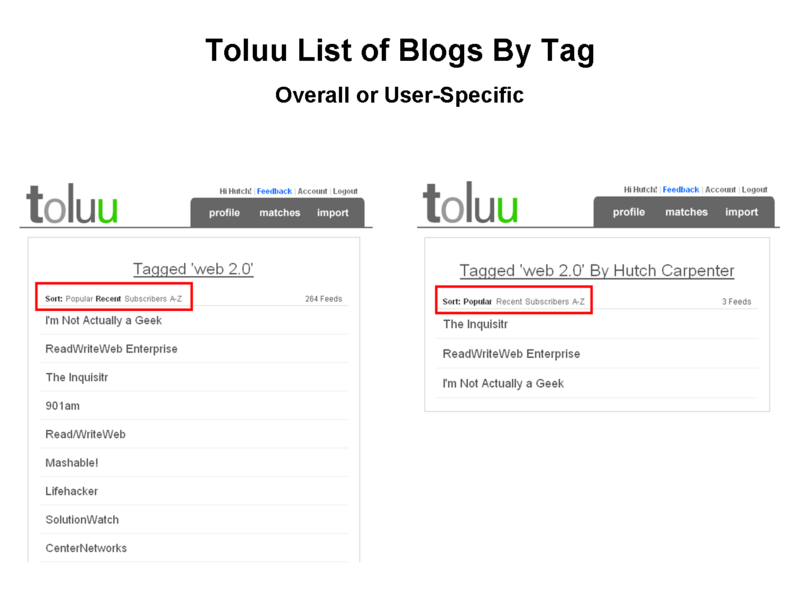 Toluu, everyone’s favorite blog recommendation application, has released a powerful new feature: tagging. Tagging is super powerful. A few simple words can bring a ton of order and new usefulness. All in all, the features bring a new level of sophistication and community-generated perspective to the blog recommendations. Let’s check ’em out. Tagging is multiple word, comma separated. Yes! Tags are auto-suggested, based on tags you’ve used before. This is a great feature. It makes it easier to add tags, and enforces consistency, which is so important in tagging. My Tags: These are the tags you have already applied to a given blog. Top Tags: These are the most popular tags applied by others to a given blog. Related Blogs: Each Tag Tab includes a list of related blogs. These are blogs that share similar tags to the ones applied to a given blog. This makes discovering a bunch of blogs with a specific area of focus very easy. In fact, it gets even easier to find blogs with a specific focus. Just follow a tag where it takes you. Notice the nice distinction above? You can see blogs with specific tags applied by anyone in the system. Or you can take a deeper dive, and see what someone you trust has tagged. To make tagging easy and pervasive, inline tagging is supported. As you look at your list of blogs, you can quickly tag them. I like this because it makes the tagging process fast and easy. 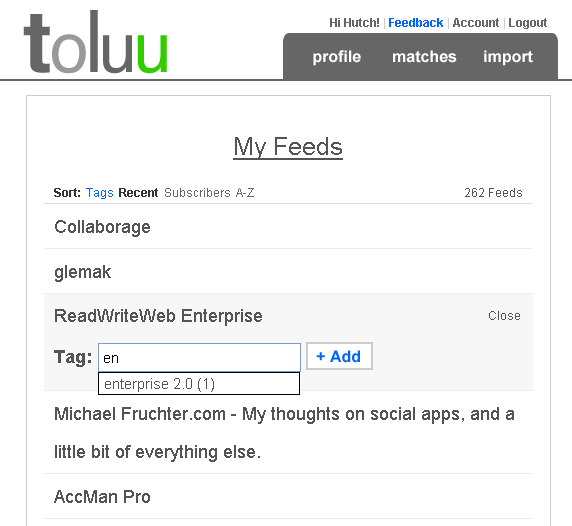 I don’t have to go to each individual blog’s page inside Toluu to add tags. All this tagging by users has another benefit. You can quickly see what someone is all about when you visit their profile in the Toluu system. This is great. Toluu isn’t a full-fledged social network, but you can use it to find like-minded people. From these like-minded people, you can discover other blogs of interest. The tags of a user are essentially a form of self-identification. Like declaring what political affiliation you have, or saying where you work. This at-a-glance insight into someone’s interests is a great way to figure out new people to follow inside Toluu. Caleb and his team have done a really great job with this new functionality. A lot of attention was paid to ease of use, and the subtleties of information discovery. He has built in the notion of discovery via the collective wisdom of crowds, or discovery via trusted information filters. Toluu continues to innovate. Click here to see all posts tagged ‘toluu’ on this blog. It’s an impressive list of activity. If you’re on Toluu, follow me at http://www.toluu.com/bhc3. I’ll follow back. And if you’re not yet on Toluu, I’m happy to email you an invite. Just leave a comment. FriendFeed’s new beta version is out. There are a number of new features there, which are well described by Bret Taylor on the FriendFeed blog. The ability to tag the people to whom you subscribe. In an earlier post, On FriendFeed, We’re All TV Channels, I described people as programming. Via our lifestreams, Likes and comments, we send a stream of content downriver to our subscribers. People make their subscription decisions based on that river of content. Tags are logical progression in distinguishing people based on programming. FriendFeed has made it very easy to set up channels based on tags, and seek out different content depending on your mood. My initial set of tags are shown above. What’s more valuable in the realm of information discovery? Finding relevant content, or finding people with relevant expertise? I like that. 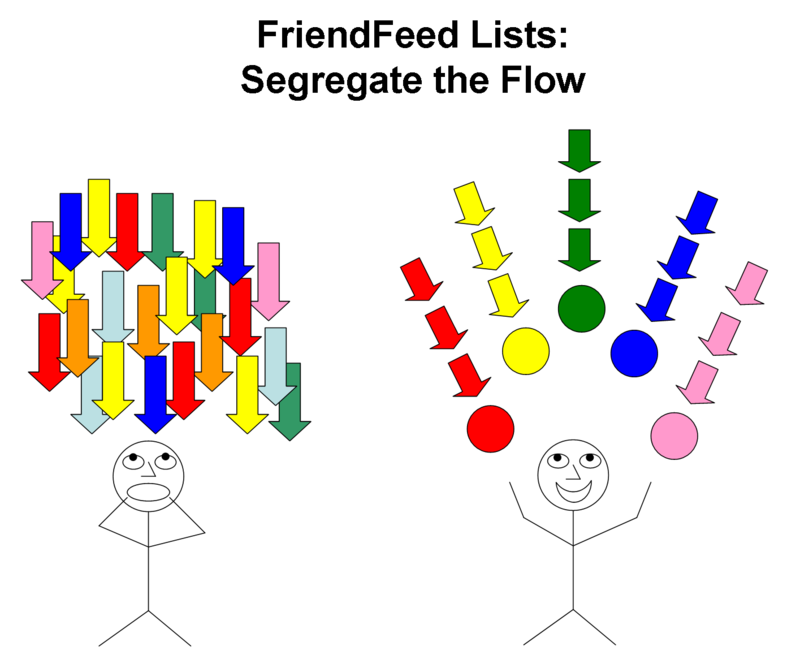 It well describes the value of FriendFeed’s new user tagging feature. In fact, FriendFeed just filled a gap in the way people find information. 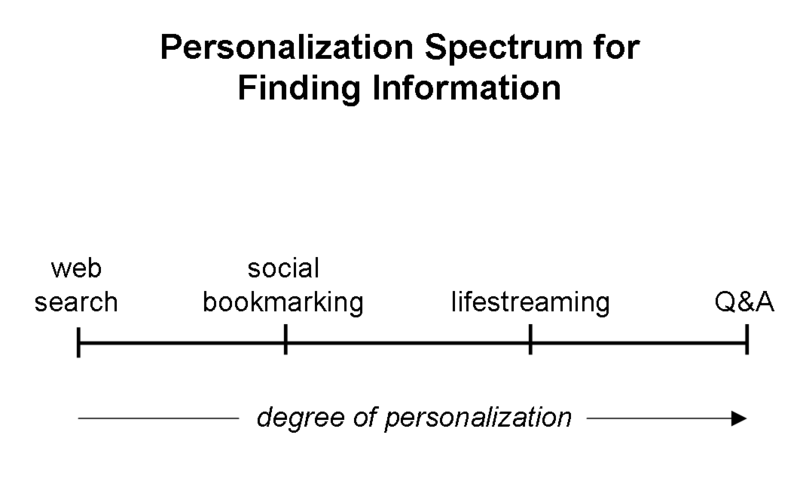 The diagram below describes a spectrum of learning that has been enabled by the Web. On the left is the search revolution led by Google. Google’s search was a revelation when it started, and it’s still going strong. On the right is a method of learning that dates back at least to Ancient Greece: question and answer. Social media fills the gap between the two. Social bookmarking (Del.icio.us, Diigo, Ma.gnolia) was a very innovative approach. What content have other users found useful? Rather than depend on Google’s crawlers and algorithm, you could turn to the collective judgment of people. What did others think was useful? Social bookmarking continues to be really good for directed searches, and serendipitous discovery. But how about a different form of finding information? A curated life. Lots of choices and more friends who I trust suggesting what they are passionate about influencing how I might spend time reading, listening or watching. A lot of good information and opinion occurs in conversational social media (e.g. Twitter). But this media isn’t usually bookmarked, and it doesn’t rank highly in search results. There are times you’re not actively trying to learn about a subject. But taking in a curated stream of content can be helpful down the road. You may not even know the questions to ask or the breadth of information you don’t know. Following the lifestream of someone who has knowledge about a subject is a great way to educate yourself. The value of these lifestream apps really kicks in when there a lot of users. FriendFeed is growing, but you had to accept all lifestreams combined (which has its own merits). With the new tagging capability, you can set your “programming” the way you want. I initially wasn’t sure about the new design of the FriendFeed beta, as I liked the spare quality of the original. But I’m warmed up to it now. Tagging people’s lifestreams….cool idea. How Would Social Media Help You in Your Job? I’m having a ball with social media out in the consumer web. Blogging, FriendFeed, Twitter, Facebook. I’m learning so much about technology, new companies and people’s attitudes regarding Web 2.0. Along the way, some collaboration and a new job actually happened out of all this fun. Now why can’t we see some of these same effects in the place where most of us spend a third of our day? We’re seeing live implementations of social media inside organizations (aka Enterprise 2.0). It’s a good sign. Both companies were examples of today’s modern company, with a heavy information orientation. It’s been years since I worked at either, but here is how social media could have helped me in my jobs. The buying office of a retailer is responsible for picking the merchandise you see on the floor. Buyers also plan and execute promotions, set prices and ensure optimum amount of inventory on the floor and in the warehouse. We also had to communicate with the department managers of dozens of stores. Twitter: Yup, I would have loved Twitter. An easy way to fire off updates out to the field of department managers. And they would have sent back news of things they were seeing. Would have been a huge help during the crazy Christmas season. Blog: I would have blogged about the weekly promotions. There’s a fair amount of work that went into them (promo prices, signage, focus of the ads), and documenting all that would have been useful. New products that we bought would have been good to discuss as well. Bookmarking and notetaking: Assuming we had the world wide web back then, I would have bookmarked and noted a number of things for the job: competitor ads and pricing, product promotions I liked, new products I’d seen elsewhere. At BofA, my group raised debt for corporations. Deals could run anywhere from $25 million to $6 billion. It was an information-intensive job. The work consisted of three primary activities: (1) win the deal; (2) sell the deal; (3) close the deal via documentation. You had to stay on top of comparable deals, industry trends, capital market trends and general market chatter. Our group was divided into Structurers (me), who worked with clients to win and structure deals; and Distribution, who sold the deal to the market. Distribution always had the best information. Twitter: Again! I really would have wanted to see the ongoing chatter of the Distribution guys. They picked up all sorts of incredibly valuable market intelligence during the day. They used to IM. Now I’d want them to tweet. Wiki: Every deal should have had a wiki space, with its “win the mandate” phase, its “sell it to the market” phase and the documentation phase. Wikis would have been good for handling the whole deal cycle. Feed Reader: There were market data publications to which BofA subscribed. Getting a feed of deal information would have been a huge help. We were chasing information down in paper publications. Bookmarking and notetaking: When deal, market or industry news came through, I needed a place to save it. I was always going back to find stuff I’d seen earlier. Bookmarking would have helped a lot. Note taking too – capture some information or thoughts, tag it and come back to it later. Blog: My group wouldn’t have had much use for a blog amongst ourselves. But a blog that updated the rest of the bank as to what was happening in our particular capital market (syndicated loans) would have been perfect. We had other groups asking us often about market conditions. If you’ve got any ideas to share, I’d love to hear them. Sites and social tools like these and many others encourage more participation on the social web than ever before. Although the social participants on these sites are often more active in socializing than they are in blogging, there’s still that need to stake out your own piece of real estate on the web. But we wonder: does that really need to be a blog anymore? Perhaps not. It’s a great concept, one that Mark Krynsky has been chronicling for a while at the Lifestream Blog. Because there is one thing that has been noticed with all this lifestreaming – there’s a lot of information generated (or “noise” as some might say). What do I mean? Read on. And I’d like to see tag clouds for what users Like and Comment on. Because on FriendFeed, Likes and Comments have the same effect as a direct feed of someone’s lifestream: they put the content into the feed of all their followers. So via the tag cloud, I’m can quickly come up to speed on what someone is interested in. I don’t propose that users suddenly tag their own streams. Rather, let’s leverage the work of others. It’s de rigueur for Web 2.0 apps to include tagging. Bloggers tag. Social bookmarkers tag. Music lovers tag. Why not pull the tags applied to the source content into the lifestream? 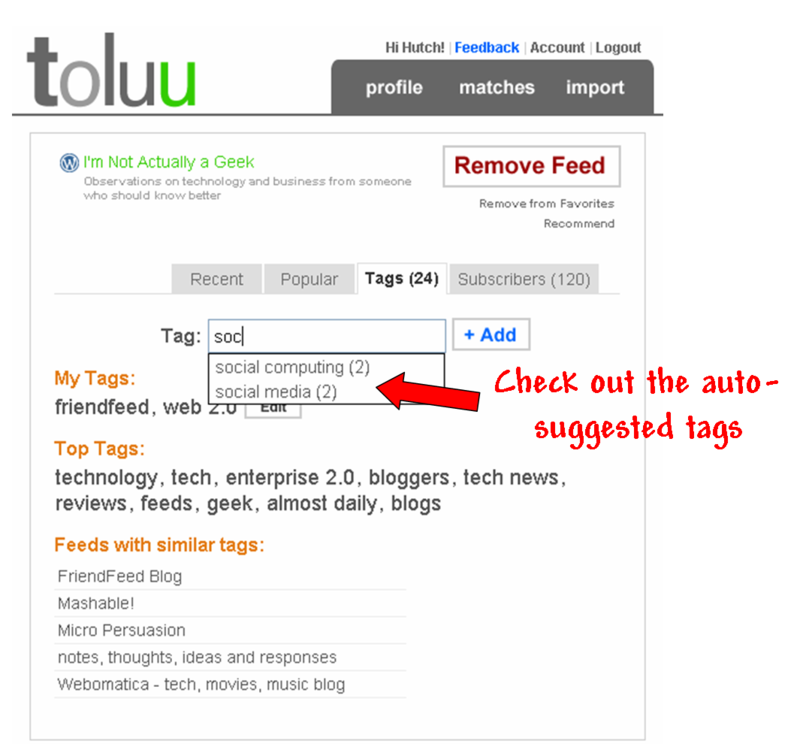 For some background on this, click here for a page on Technorati that talks about tags in feeds. By leveraging the tagging work already resident in user-generated content, one can quickly build up a tag cloud for lifestreams. Google Reader is a good example. People ‘share’ blog posts they read via their Google Readers. Sharing lets others see the articles that someone finds interesting and useful. And of course, those blog posts that someone is sharing have tags. Here’s what the tag cloud of my recent Google Reader shares looks like. I’ve simulated the tag cloud by using Wordle for the tags. 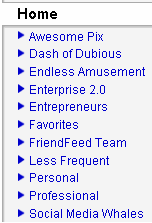 You can see my interests lately: Enterprise 2.0, FriendFeed, social media. If someone wanted to get a quick sense of the things they’ll see by subscribing to me, this tag cloud answers that. And if someone is curious about the specific posts I’ve been sharing that relate to a subject, they could click on one of the tags and get a list of my Google Reader shares. Robert Scoble clearly is following the iPhone and Google. Louis Gray was following the happenings at Gnomedex. Sarah Perez is pretty even in her interests, with FireFox, social bookmarking, FriendFeed, Twitter, search and photos among her favorite topics. Mike Fruchter has been reading up on Twitter and social media. Just like that, I’ve gotten a sense for their interests right now. And if those were true tag clouds, I could click the tag and see the Google Reader shares. Robert Scoble is really good at tracking useful relevant things. Clicking the ‘iPhone’ tag and reading his shares would be a quick way to understand what’s goin. As I said, most user generated content comes with tags these days. So pulling these into the feeds and representing them in a tag cloud would be a fantastic move forward in creating lifestream tag clouds. But what about Twitter? There are no tags on tweets. Not a problem. FriendFeed and other lifestream services could do a Wordle-like tag cloud. Tally the most common words in someone’s tweets, represent it as a tag cloud. And make the tag cloud clickable, which would essentially run a Summize Twitter search of the user’s tweets for a given tag. The key here is to not make it onerous on the end user. Tag once, re-use everywhere. If desired, users could be given the option to add tags to their own lifestreams. But the core idea is to eliminate double tagging work for users. If this could be done, you’ve got a visual representation of people’s lifestreams. And an easy way to find the specific entries in a lifestream that relate to a topic.